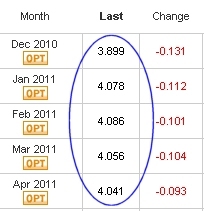 Contango for early 2011 contracts has ended, in fact there is slight backwardation in March and April. Shall this situation continues, UNG may actualy benefit. Prices may also lift due to winter drawdowns. Note that UNG contracts for this month have already rolled over, which was the only place where there was contango for the next 5 months. This does not mean that this contango won't be carried over on a month to month basis. Next rollover data is December 14. 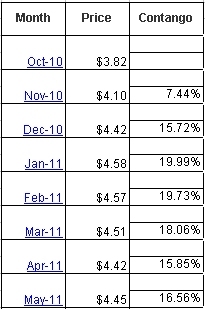 However, note that the prices were 10-15% higher back then.